The Essex Yacht Club was founded in 1890 and has occupied the same site, on the foreshore East of Leigh-on-Sea ever since. To encourage and popularise yachting, sailing and amateur seamanship in all its forms, and particularly to encourage young people in these pursuits. To advance in all suitable ways the education and training of its members and others in all matters relating to navigation, seamanship, saftey and good manners at sea and on inland waters and to provide social and sporting events, arrangements and facilities for its members and their guests. Unusually, the club has, almost since its founding, been headquartered on ships. Currently we are based on a former Royal Navy mine hunter HMS Wilton that was purchased in 2001. The ship is notable for being the world’s first GRP warship. In 2004, after extensive conversion works, she was ready for service. Being immune to the rust problems that ended the careers of her forebears, we hope she will house the club for generations to come. 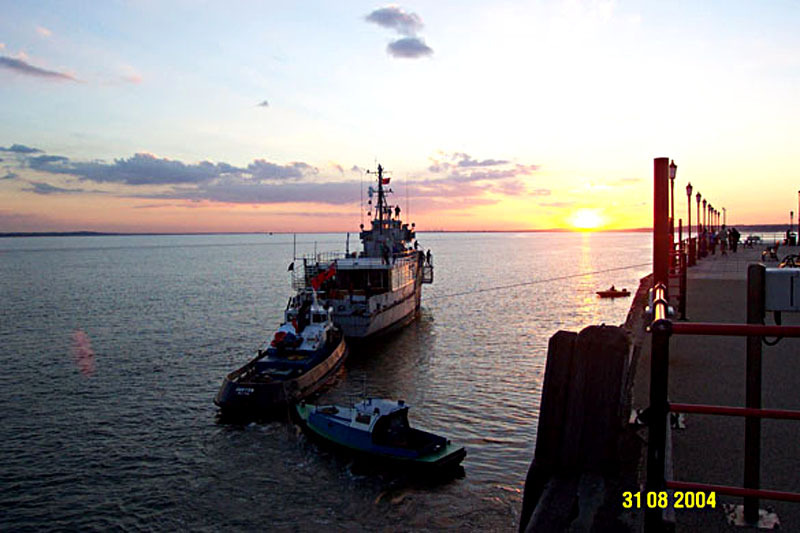 Here she’s pictured rounding Southend Pier being towed to her new home. Below is a photo gallery containing photos of our current HQ, The Wilton.